Genealogy of Jones, Orme, Bird, Allen, Rees, Waite, Hainsworth, Butler and others. A genealogy of Jones, Orme, Bird, Allen, Waite, Hainsworth, Butler, Rees and other families. This is the results of my attempt to trace my family history. Much of it is the work of others or the knowledge of my relatives. For my own purposes, I've created a table showing how many genes shared with 1st to 7th degree relatives. The table has an introduction in which I discuss the implications of this table on genealogy. 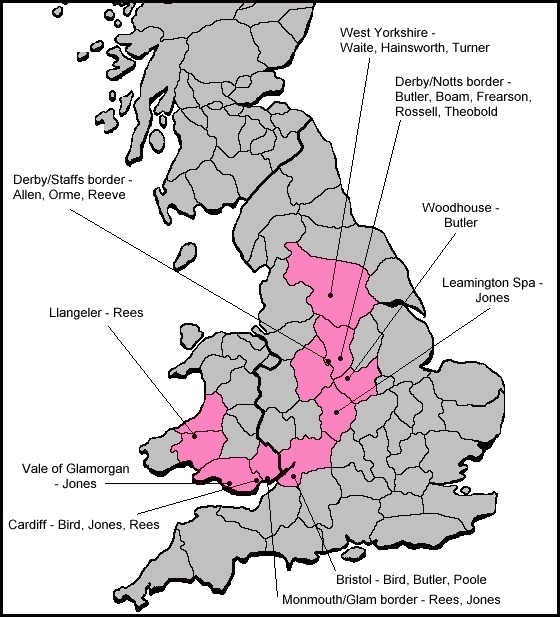 Tithe maps & apportionments in development or planning: Longford, Trusley, Burton-upon-Trent, Burton Extra, Marchington, Marchington Woodlands, Marston Montgomery, Anslow, Rolleston, Horninglow, Dalbury, Church Broughton, Sudbury and Middleton. Sadly there are no tithe maps for Hatton or Hilton although a good proportion of Hatton is available under Church Broughton. Here is some analysis I've done on some of the surnames of my ancestors. The following charts show who my dead ancestors and relatives were. I am less certain about some of the people on the fringes than I am of the central characters. It's been a lot harder to find out about my Welsh ancestors than my English ones. To an extent, this has been because there are so few Welsh surnames shared by so many people. The result is that, despite the fact that I am half-english and half-welsh, the majority of people on these charts are english. I would love to make contact with any distant relatives and have any mistakes corrected. My contact info is at the bottom of the page.